berryjon: im gonna have to strongly disagree that rosewater is in touch with the community, or undeserving of his criticism. if he were in touch with the community, he wouldn't be making decisions that a large portion of us don't like. this is a man who said "Rampant Growth is too strong". if i had been his boss, i'd have fired him immediately for that comment alone. 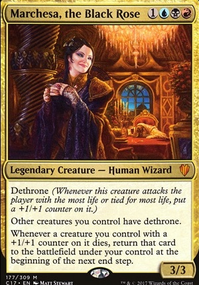 i (and many others) am also not a fan of him saying that "cheesecake" art is bad, but Enthralling Victor (recently reprinted in battlebond) is just fine. 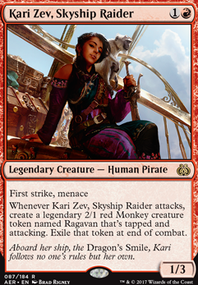 Some new fun additions with your creature recursion: Kari Zev's Expertise, Captivating Crew and the less-viable Enthralling Victor. Bazaar Trader and Conjurer's Closet to Shanghai the opposing creatures with. Enthralling Victor for the little ones (and his art). 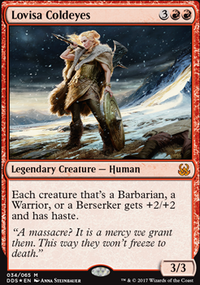 Starke of Rath and Humble Defector are targets when you are playing creatureless opponents (and flavor). If you add those two include Homeward Path. I feel like the flavour could be pushed up a notch or two. 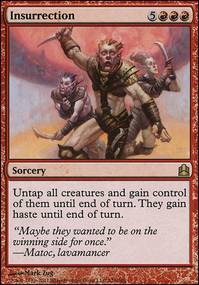 Throw in some looting/rummaging effects Academy Raider, Curse of Chaos, Daretti, Scrap Savant, Vaultbreaker, Dragon Mage, Wild Guess, to name a few. Prophetic Flamespeaker to get cards off the top, Grenzo, Havoc Raiser to get cards off the top of others' decks. 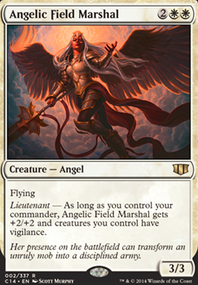 Maybe go deeper with theft effects with Zealous Conscripts, Unwilling Recruit, Frenzied Fugue, Besmirch, Enthralling Victor, Blind with Anger, Harness by Force, etc. Also, the stereotypical pirate has only one eye, right? So why not Bloodshot Cyclops and Cyclops Gladiator? I mentioned Flame Fusillade and Furystoke Giant to you already, but what about Titan of Eternal Fire and Seismic Assault? You might as well get in damage where you can! Finally, since no pirate ship is complete without a supply of rum, Elixir of Immortality and Thousand-Year Elixir. Drink up, me hearties, yo-ho! 2. Other creatures and/or threats. Duskwatch Recruiter Flip seems like a really good addition because he comes out early, and as early as turn 3 can start sifting through the library 3 cards at a time to find Willbreaker. 3. Willbreaker will need protecting once it's out. Mizzium Meddler can act as a filter for spot removal. Someone targeted Willbreaker with a kill spell? Just flash the Meddler in and he takes the Ruinous Path on the chin instead. Glint gives a creature hexproof, which is handy in a pinch and also gives it +0/+3 which means it will survive Languish, Grasp of Darkness, Lightning Axe or other damage based spells. How about a combination of a Meddler and Glint? Say hello to Void Grafter! 4. Resiliency may be an issue after your opponent knows what you are up to. If you manage to get Willbreaker out, maybe you can copy him with something like Altered Ego? Or use it to copy something nasty that your opponent has as a deterrent from attacking. 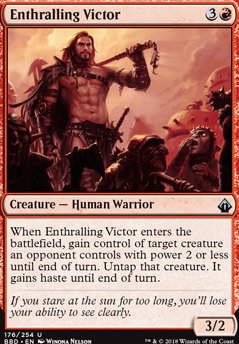 Adding red gets real fun real quick...Eldrazi Obligator, Enthralling Victor, Act of Treason, Malevolent Whispers, Turn Against, Lose Calm, etc. If you are going for stealing, or control, why not run Act of Treason, and or Enthralling Victor? This would give you even more options to take over creatures. I like the use of Zada, Hedron Grinder as a finisher, but given that you have Zada, why are you running Volcanic Strength? What about Incite Hysteria or a Intimidator Initiate? I know you want the mountainwalk so you can give them a mountain and then have an unblockable creature. This way you might have more than just one.